Supporters and friends of Carroll Community College gathered below the cathedral ceiling of the Great Hall, showered by moonlight, on Dec.13, 2006. They were at the college for Starry Night, a gala fundraiser sponsored by the Carroll Community College Foundation, Inc. This premiere, upscale event began with a reception in the Great Hall, followed by a performance of the Moscow Symphony Orchestra (MSO) in the theater in the Scott Center. The MSO was established in 1989 and is one of the top orchestras in Russia. The performance at Carroll was part of an East Coast tour. At 8 p.m., the orchestra began a two-hour performance of classical, popular, and holiday selections, before an enthusiastic audience. Carroll students Zachary Shanks and Lauren Stallings performed with the orchestra. Music faculty member Jon Seligman also joined the performance onstage that evening. The evening concluded with desserts and conversation in the holiday-decorated Great Hall. Proceeds from Starry Night supported the Partners Campaign, Carroll’s first-ever major gifts campaign. Over 400 people attended the event, which netted about $40,000. Funds for the event were generated through sponsorships, ticket sales, a silent auction, and gifts-in-kind. Several hours before the performance, music students had the opportunity to work with members of the orchestra in master classes held at various locations on campus. Students performed musical selections and received feedback. Faculty from Carroll, McDaniel College, and surrounding institutions recommended 20 students to be included in the experience. Students played the violin, flute, trumpet, and percussion instruments for their mentors. “The goal of this type of interaction between a student and a professional is to give the student a different perspective on his or her individual abilities and techniques,” said Elijah Wirth, director of music at Carroll. Martin K.P. 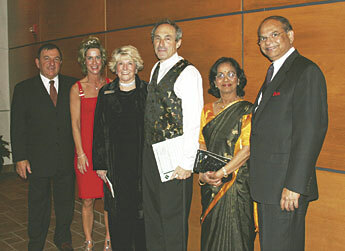 Hill, Kelly W. Hill, Dr. Faye Pappalardo, Charles Anspacher (guest conductor), Dr. Vimala Naganna, and Dr. Chitrachedu Naganna at the Starry Night gala. 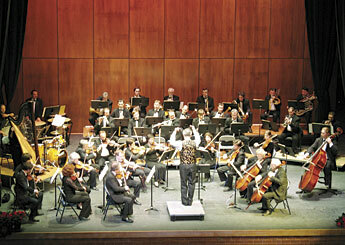 The MSO performing in the Scott Center. 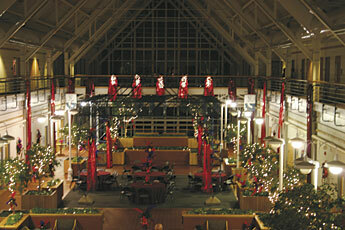 The Great Hall decorated for Starry Night.